Editor's note: As we embark on this new year, we wanted to share a letter we sent to our Google for Education customers in North America celebrating the great work of 2015. Thanks to our entire education community for making 2015 such a strong year. We look forward to what we can do together in 2016 for educators and the world’s future inventors and changemakers. What a year we’ve shared. First: thank you to the extraordinary teachers, students, administrators and others who make Google for Education strong. We couldn’t do it without you. In 2015 you activated 30,000 Chromebooks every school day more than all other education devices combined and you helped us grow to more than 50 million using Google Apps for Education (GAFE) and 10 million using Classroom. 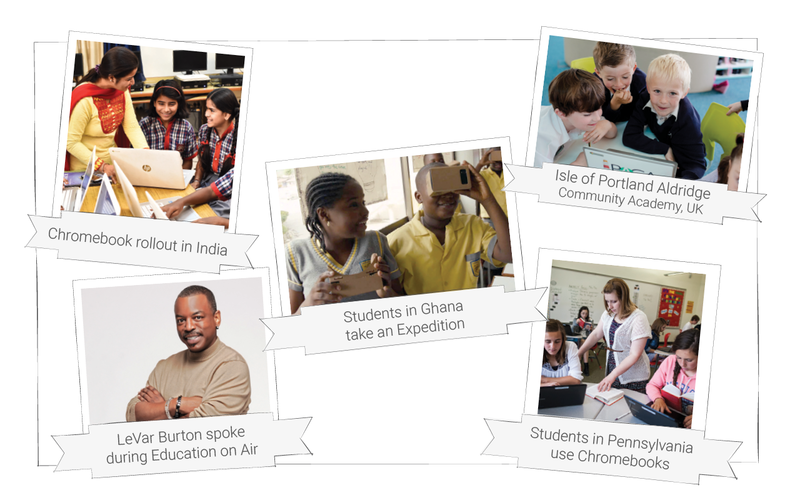 As educators, you put Chromebooks in the hands of 90,000 students in Charlotte and 84,000 students in Chicago; you moved the entire Montgomery County, Maryland school district to GAFE and Classroom; you improved young learners performance by 19 percent with the support of Google devices at the Isle of Portland Aldridge Community Academy in the UK; and you brought science education to rural Australia using Bring Your Own Device (BYOD) and GAFE at John Monash Science School. 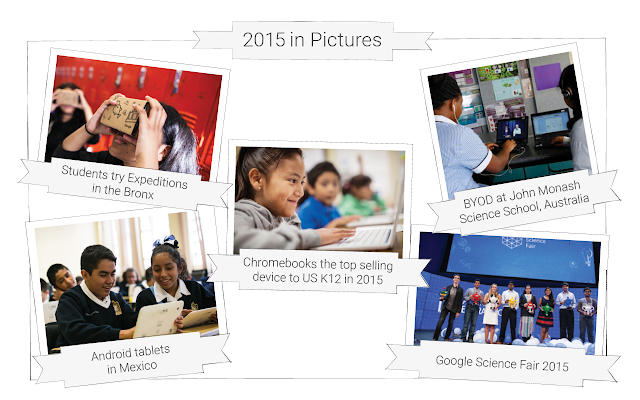 And we’re just getting started: here at Google we’re committed to bringing the best of technology to education. We’re investing heavily in Chromebooks and you can expect to see many new Chromebooks created for you in education. You’ll also see new management features for administrators, interactive educator support in our new Training Center and pioneering Chrome tools like this year’s Share to Classroom extension. And we’ll continue to bring Google innovations to the classroom as we did in September with the Expeditions Pioneer Program — already more than 100,000 students have taken virtual field trips to places like the Great Wall of China and Chichen Itza using Google Cardboard and a phone. Giving back to education is important to us. Along with offering the GAFE suite and unlimited Drive storage at no cost to schools, this year we contributed more than $50 million, including more than $14M to education nonprofits, $1.3M in scholarships, and $21.7M funding new research. With programs like Google Science Fair, Made with Code, CS First and Doodle4Google, we’re working to inspire and encourage young people to solve tomorrow’s problems through curiosity, creativity and code. Thank you so, so much. Your support in 2015 was an inspiration to us. We wish you a Happy New Year, and we hope to continue to do great things together in 2016. Take a look through our Google for Education 2015 Year in Review. 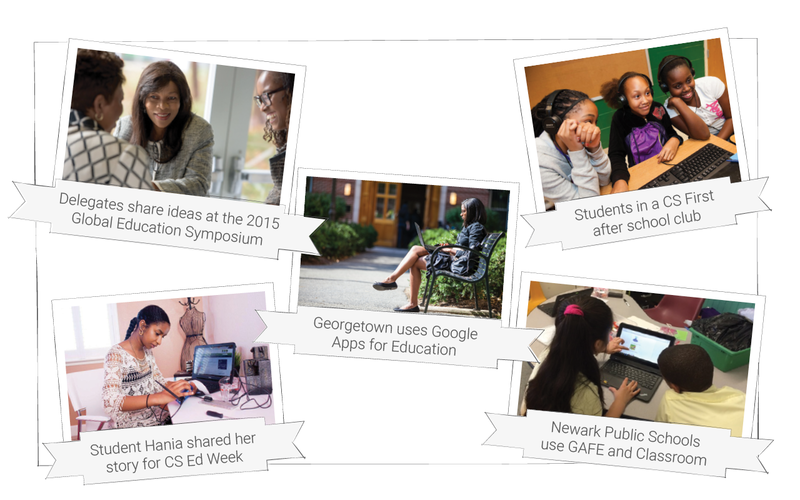 Stay in touch in 2016 at google.com/edu with our blog, Google+, Twitter or a Google Educator Group.